Pudri Rekpung (Tib. སྤུ་གྲི་རེག་ཕུང་, Wyl. spu gri reg phung), ‘The Razor that Destroys at a Touch’, is a Vajrakilaya practice revealed as a gongter by Dudjom Rinpoche in 1937, while he was in retreat in Paro Taktsang, Bhutan. While there, Yeshe Tsogyal appeared to him in the form of a female turquoise dog and gave him the empowerments, oral transmission and instructions for this practice. In 1937, while he was in his early thirties, Dudjom Rinpoche went for pilgrimage to Bhutan, and at Paro Taktsang, he decided to do a retreat. While there, he revealed his terma practice of Vajrakilaya ‘’Pudri Rekpung’’. “The secret teachings and pith instructions of all the tantras in a single state, the heart essence of the hundred thousand Vajrakilaya teachings is called Vajrakilaya Pudri Rekpung, Vajrakilaya, The Razor that Destroys at a Touch. It condenses the personal Vajrakilaya practices of the three great masters. Just as Guru Padmasambhava bestowed these teachings so dear to his heart on the assembly of king and subjects, so they practiced them. To secure the Vajrakilaya teachings for future generations, the majority have been transmitted orally, many have been hidden as earth treasures; and some have been hidden in the wisdom mind-essence, free of wordiness and fabrications, yet all the core meanings are here. Its extraordinary sharp power and blessing are greater than any other. When Guru Padmasambhava was leaving for the southwestern subcontinent to subdue the cannibals, he inconspicuously handed me, Yeshe Tsogyal, the woman from the Karchen clan, the profound secret teaching as a parting gift. So precious is this teaching, I chose not to hide it in any common way and instead sealed it in the heart of the one with pure wisdom mind and good fortune who is no different from me”. 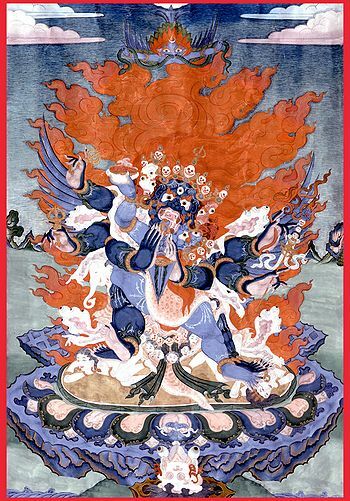 In the fire Ox year, 1937, on the full moon day in the Trumtö month, I, Jigdral Yeshe Dorje, was thirty-four years old and doing practice to make the dharma nectar medicine according to the Vajrakilaya sadhana, Sword of Meteorite, at Paro Taktsang in Bhutan. In a dream, a woman with a beautiful dress and ornaments whom I knew to be Yeshe Tsogyal handed me a six-inch clearly detailed meteorite phurba and said, “This is the actual ritual implement that Guru Rinpoche held here in this place, when he transformed into Dorje Drolö and put under oath all the eight classes of mighty invisible beings ,and in particular the gyalpo and senmo. Later, at Gungtang Mountain Pass, Guru Padmasambhava gave me this phurba as a farewell gift. Now I am giving this to you. You must keep it as your heart treasure.” She began to put it in the fold of my chuba, and at that moment I was so happy, I grabbed it quickly, and thought, I am going to receive an empowerment. I touched it to my forehead and throat. When I touched the heart center, instantly that phurba and I became inseparable. The upper part of my body was as itr is now, but my lower body had become an iron phurba with sprking flames. 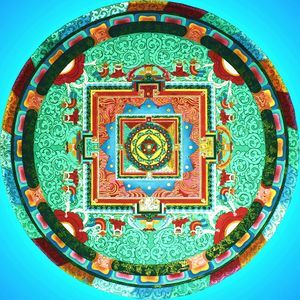 I was chanting the Vajrakilaya mantra and felt the whole earth tremble and shake. At that moment that girl said to me, “That is the real empowerment and blessings. This is the treasure of all tantra teaching and pith instructions in one single state. Don’t’ neglect this, it has great purpose. Do you remember completely receiving these teachings, empowerment, and pith instructions from Guru Padmasambhava in ancient times?” Then she pulled my hand, extending my arm, and I woke up. At that very moment I remembered many things past, and, particularly, all the Vajrakilaya teachings I had received came clearly in my mind. If transcribed directly as it was arising within the expanse of rigpa, this Vajrakilaya teaching would be much larger than those of the two tertöns. There were many instructions and action practices that those did not include. In 1948, eleven years after its discovery, Dudjom Rinpoche wrote a very clear, condensed version of the Vajrakilaya treasure revealed in the cave, which is entitled Pudri Rekpung ‘The Razor that Destroys at a Touch’. ↑ Khenpo Tsewang Dongyal, ‘Light of Fearless Indestructible Wisdom’, page 184-187. ↑ Chagdud Tulku Rinpoche, ‘Vajrakilaya, The Razor That Destroys at a Touch, a Treasure of Kyabje Dudjom Rinpoche’, CD with the practice chanted by Chagdud Tulku Rinpoche, Dakini Music, 2004, booklet, page 5. This page was last edited on 22 February 2018, at 23:20.